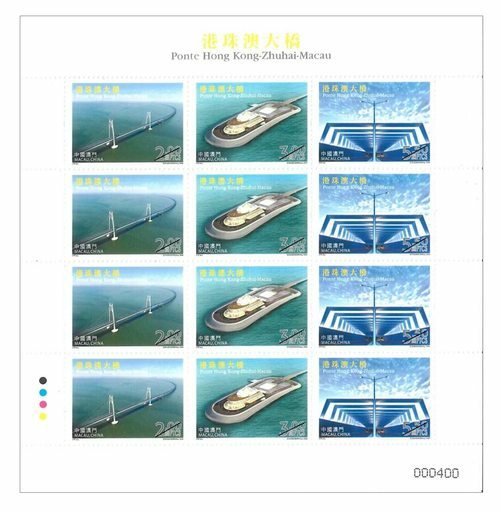 Stamp Issue "Hong Kong-Zhuhai-Macao Bridge"
To mark the Hong Kong-Zhuhai-Macao Bridge opening to traffic, China Post, Hongkong Post and Macao Post and Telecommunications Bureau are jointly issue the stamp theme “Hong Kong-Zhuhai-Macao Bridge” on 30th October, 2018. 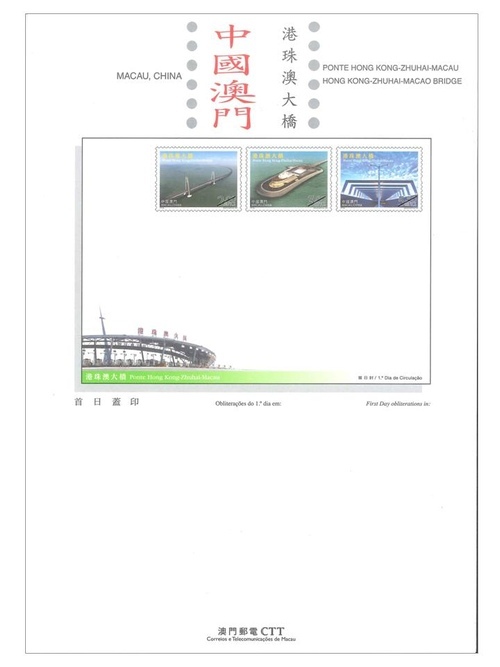 This is the tenth joint issue of the three postal administrations. 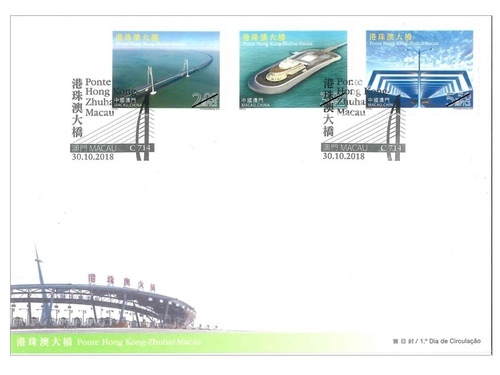 The Hong Kong-Zhuhai-Macao Bridge (HZMB) is a mega-size sea crossing project linking the Hong Kong Special Administrative Region to the east and Zhuhai City of Guangdong Province and the Macao Special Administrative Region to the west. It is regarded as an important part of the ever-expanding network of expressways in the Pearl River Delta region. With a total length of 55 kilometres, the HZMB straddles across Lingding Channel of the Pearl River Estuary. The commissioning of the HZMB will promote the growth in economy, trade and tourism of Hong Kong, Zhuhai and Macao. 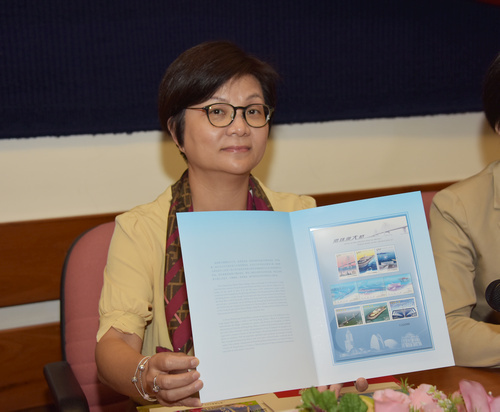 The creation of a ‘one-hour living circle’ complies with the national policies of building a closer connection among the three regions and is thus beneficial to Macao’s long-term developments. This issue includes a set of three stamps and one souvenir sheet. 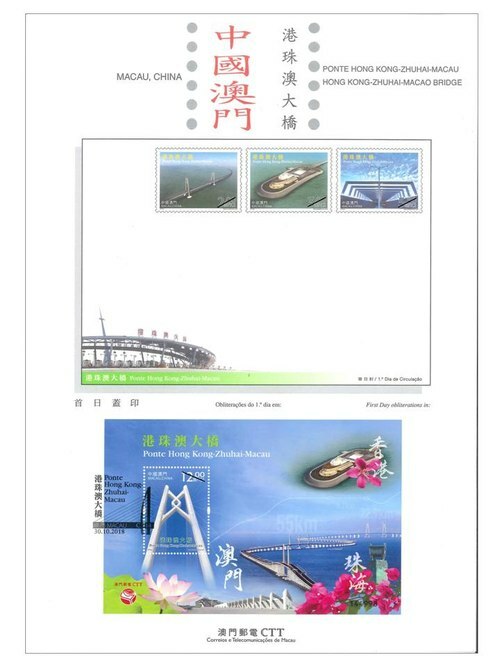 The main structure of the bridge adopts the design of bridge-island-tunnel combination, that are displayed in the design of the three stamps of the three postal administrations, namely: the Qingzhou Channel, the Eastern Artificial Island, and the underwater tunnel. 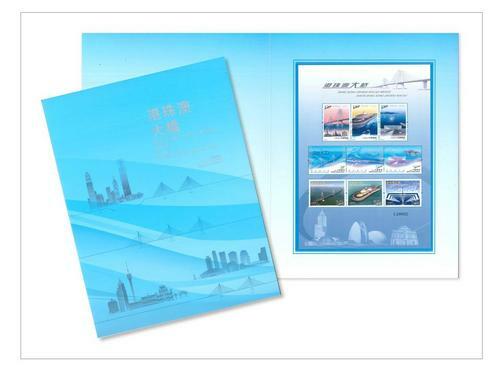 The souvenir sheet illustrates the Qingzhou Channel with the iconic “Chinese Knot”, together with the flowers “Bauhinia”, “Bougainvillea” and “Lotus Flower” symbolizing the three regions of Hong Kong, Zhuhai and Macao linking together. 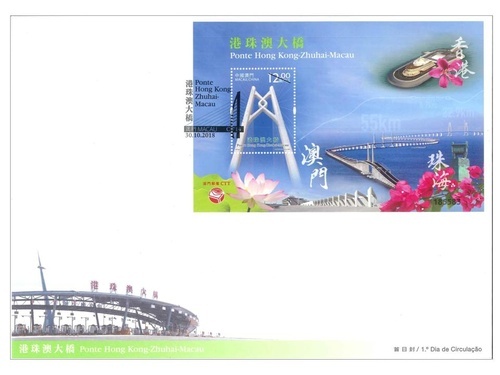 Among the total printing quantity of stamps, 262,000 sets of stamps are integrated into souvenir sheets jointly issued by China Post, Hongkong Post and Macao Post and Telecommunications Bureau, which have been transformed as presentation pack. 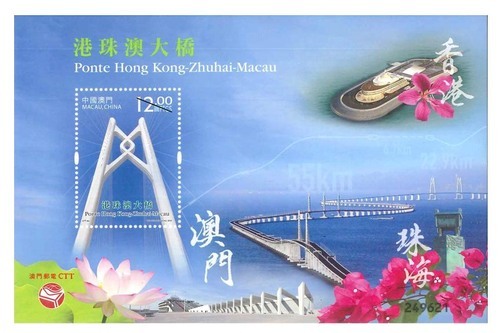 Among the total printing quantity of 262,000 packs, the total of 30,000 packs to be sold in Macao are numbered with the code “C” representing Macao, this pack is priced at 40.00 patacas each. This is the eleventh theme in 2018. The previous issued stamps are “Lunar Year of the Dog” on 05/01/2018, the label stamp “Lunar Year of the Dog” on 31/01/2018, “Macao 2018 – 35th Asian International Stamp Exhibition (I)” on 01/03/2018, “Mainland Scenery VII” on 12/04/2018, “Classic Fables and Tales” on 30/05/2018, “Joy” on 26/06/2018, “Chapas Sínicas (Chinese Documents)” on 06/07/2018, “Masters of Chinese Literature – Tang Xianzu” on 27/07/2018, “60th Anniversary of the Publication of Macao Daily News” on 15/08/2018, the label stamp “Macao 2018 – 35th Asian International Stamp Exhibition (II)” on 21/09/2018, “Macao 2018 – 35th Asian International Stamp Exhibition (III)” on 23/09/2018, “Birdsongs and Spring Flowers” on 09/10/2018, and “15th Anniversary of the Establishment of the Forum for Economic, and Trade Co-operation between China and Portuguese-speaking Countries (Macao)” on 12/10/2018. 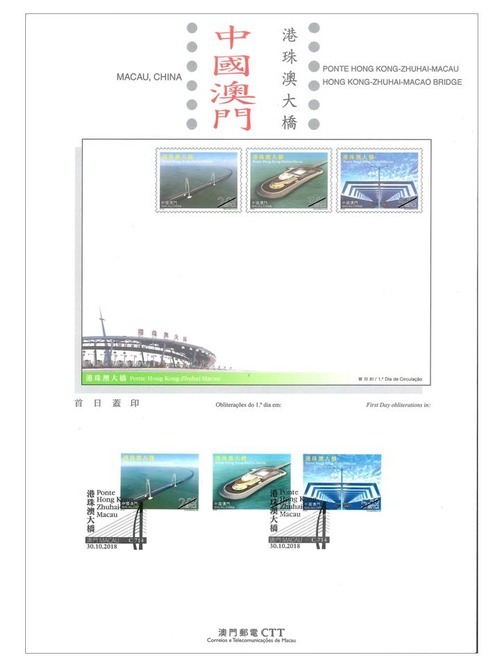 Technical Data of Stamp "Hong Kong-Zhuhai-Macao Bridge"